In recent years there has been a renewed interest in Victorian music and in particular opera. Ashgate in their “Music in 19th Century Britain” series has over recent years amassed an excellent library of well-researched reference titles on this neglected topic. This volume is the latest. It is the third book written on 19th Century music by Paul Rodmell of Birmingham University. Thoroughly researched, he explores a previously forgotten and hidden world of musical theatre not touched on in this depth by other researchers in the field. 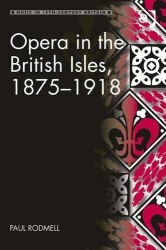 The chapters of the book are evenly weighted; starting with the situation of opera as found in 1875, then exploring Opera in London, followed by Opera in the Provinces and ending with a wide and thought-provoking discussion on the Operatic Problem. A useful Appendix catalogues the works of both major and minor operatic composers, where the premières took place, their cast and a brief synopsis. I would, however, have liked to have known the number of performances of the opening runs (where the information is to hand) as given in Ganzl’s reference tome on Musical Theatre. Most useful are the series of tables that list the premières given by Covent Garden, the Beecham Opera Company and other touring companies. I would also have preferred the starting date to have been 1860 rather than 1875, since at that time there was a heyday of British composer commissions provided by the Pyne-Harrison company based at Covent Garden. One omission noticed is any mention of Sullivan’s Martyr of Antioch. Although strictly an oratorio, this piece was presented as a fully dressed stage-work by the Carl Rosa Opera Company (1898) and was well received. A welcomed reference is made of Sullivan’s Beauty Stone made popular this year with the Chandos recording and BBC Radio 3 broadcast. It is a Savoy opera which stands apart from the formulaic Gilbert & Sullivan as true opera. Fascinating to me is the detailed information given about ‘The Grand Opera Syndicate’, a board of directors who between them ran the opera interests at Covent Garden and decreed what repertoire would be played in London. Although the Syndicate had kept the touring companies (with their knockdown ticket prices) out of London there was little real opposition until Joseph and Thomas Beecham appeared to form the London-based Beecham Opera Company with its strong financial resources. The interaction between the Beechams and the Syndicate is carefully documented by Rodmell, and it makes most interesting reading. He shows that the repertoire chosen by the Beechams excelled that of the Syndicate, which sometimes made poor choices: they were criticised by the Press for doing so whilst the Beecham Opera Company was generally praised. Eventually, the insular Syndicate decided to invite Thomas Beecham to join their board in 1910. Active theatre in London was initially curtailed at the outbreak of the First World War, but then gained ground and minor companies became able to flourish with their meagre resources. Interestingly, Covent Garden theatre was requisitioned by the Government in 1917 to be used as a furniture store. Rodmell has unearthed a lot of information about the touring opera companies. Well known are the Carl Rosa, Turner and Moody Manners opera companies, but how well known are the Neilson, Ridding and Elster-Grime companies? They all played their part in bringing opera to the masses at prices the wider audiences could afford. Some of these companies played in ‘remote’ places like Southport, Eccles, Crewe and Cork. These out-of-the-way places could be accessed by branch lines where train specials were used to convey cast, musicians, scenery, properties and possibly a piano filling attached wagons that would be shunted into the town’s sidings for the week’s duration. Of the composers it is good to see a wide variation of continental and British names. The German and Russian schools were well represented by Wagner, Strauss, Rimsky-Korsakov and Borodin and the French and Italian schools by Gounod, Auber, Hérold, Verdi and Puccini. In Britain, Smyth, Stanford, Clutsam and Cowen were regarded as our top opera composers. I was particularly pleased to see names in the book’s composers’ catalogue that have scant or no mention in Grove Music, like Cellier, D’Erlanger, O’Dwyer and Philpot. This is the UK’s heritage, after all. This book is a very readable volume that has been meticulously researched and will serve as good reference material for years to come.